Normally on Thursday of each week I begin to get what feels like inspired thoughts for my next WOW post, and I start to draft it the next day with a view to posting it on the weekend. But this week I was thrown off course by medical matters – preparing for, going to, and recovering from medical tests that I’d been postponing and, honestly, dreading. My M.O. when it comes to doctors has always been to avoid them unless or until things look dire. This situation seemed to qualify. 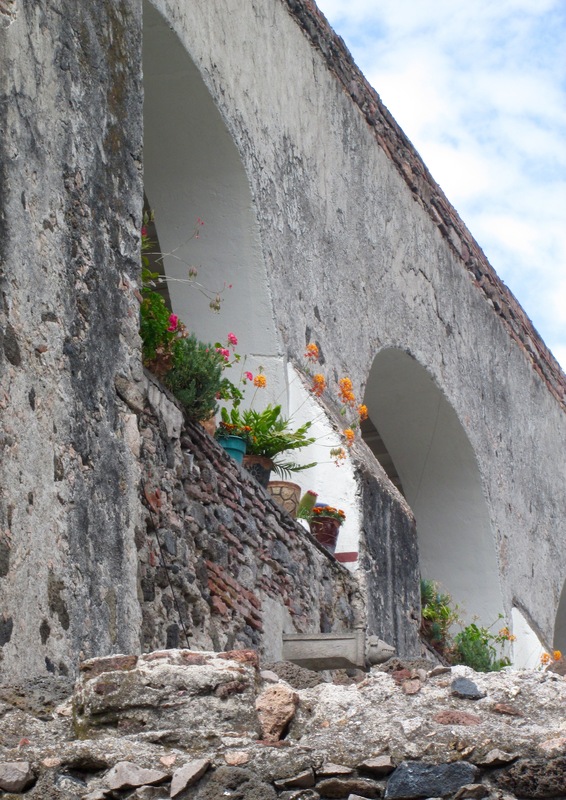 My internist here in San Miguel de Allende, a young woman who appears to be no more than thirteen years old, sent me for tests in Celaya, an old colonial city (founded in 1571) a little over an hour away. As I understood it, the hospital there had the best, most up-to-date equipment for what I needed done. I dressed in black (as if for my own funeral?) and tried to stand tall. My Mexican friend Ramiro took me there and stood by me, pretending, it seemed to me, to be my husband. The doctor who performed the tests held my hand as he explained (in Spanish) what he was about to do. I understood some of what he said. The nurses and technicians were kind and gentle. One technician spoke English. She said to me, “You must help us.” She made me feel as if I were part of a team. After it was all over, Ramiro took me to a food stall at the mercado for chicken soup. I hadn’t eaten in two days, so I was feeling weak and trembly. It was the best chicken soup I’d ever had. While Ramiro and I waited the two hours before returning to the hospital for the x-rays and written results to take back to my doctor here, we walked around the glorious city center in the sunny, springlike weather. We stopped into the cool, dark San Francisco church (built in 1715), where we sat for a short while to pray before we moseyed on. 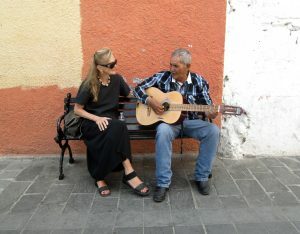 Along the way we heard a man in a passageway playing a guitar and singing beautifully, so Ramiro, ever outgoing and ready to sing, joined him in a duet. 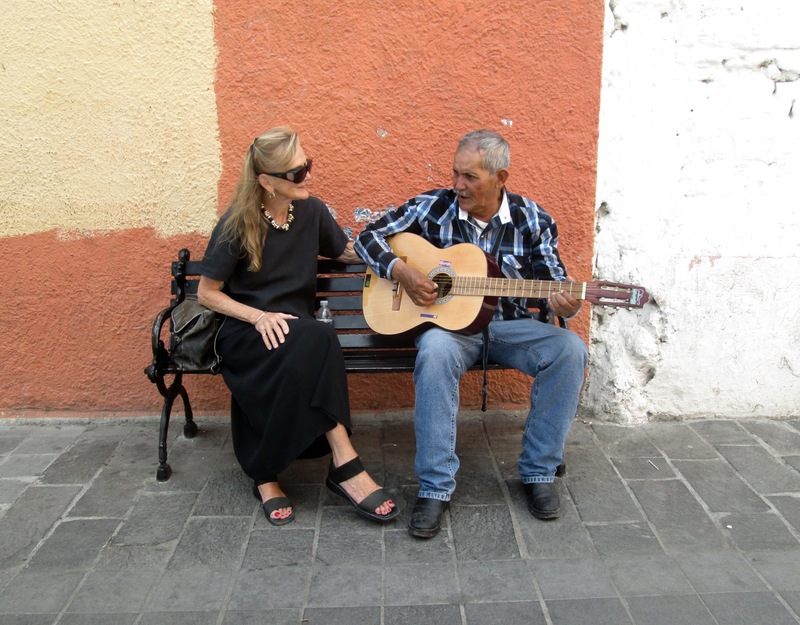 Then Ramiro asked me to sit beside the old balladeer, whose name, I learned, was Marcos, so Ramiro could take my picture as Marcos serenaded me with Mexican songs filled with the words amor (love) and corazon (heart). The medical results revealed no tumors – which, of course, are what I’d been sure were lurking inside of me – only, it appears, age-related issues I’ll have to live with for maybe a long time. I plan to live out that time here in Mexico, which is so filled with corazon. I have friends in the States who tell me they’re hesitant to visit me in Mexico because they’re afraid of the dangers. These friends, though highly intelligent and educated, seem to have accepted the bad press Mexico gets in the U.S. as truth. Many other Americans, I’m afraid, buy into the wicked things the President-and-Bully-in-Chief has said about Mexico and its people. If only they knew the truth.